Build big – build fast. 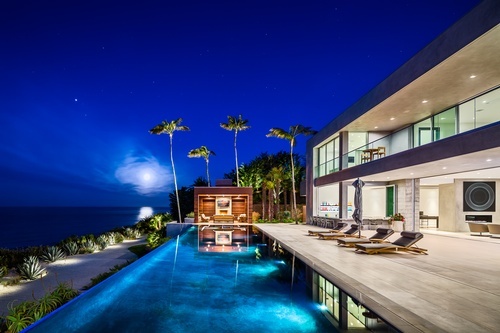 Located on the oceanfront bluffs of the exclusive MariSol community, this unbelievable modern home graces Malibu w/ amazing whitewater & island views. Just a short drive from Santa Monica via scenic highway 1 & conveniently adjacent to the private jet center, this 7bd, 11ba home will truly appeal to the most discerning buyers. The dramatic entrance is flanked by tropical landscaping & art that reveals wide walls of glass opening out to a stunning infinity pool. This jaw-dropping home also includes your own private sandy beach, roof-top putting green, outdoor cabanas, movie theater & gym. Most contemporary homes rely on bold forms & stark spatial relationships; this home dares to peel back its silky skin to reveal muscular board formed concrete walls to remind the visitor that at its heart, this home is a structure for living & not just a sculpture to inhabit. As soon as you pass through the gates you’ll discover this world of privacy & tranquility – your own personal paradise.